Have you ever seen a die cap, bottle cap or bottle top coin error? They are one of the rarest coin errors typically because such an error should never leave the manufacturing mint. This Australian 5c bottle cap error started life as a regular struck 5c piece that remained attached to the hammer or top die during the minting process. After it stuck to the die it was this 5c coin and not the reverse die that struck multiple numbers of coins. Those coins are also special, with some of them having 2 clear obverses (one incuse) and are known as brockages. As more brockages were struck the design on the die cap became more enlarged and distorted. As more coins were struck there was less and less detail visible on the brockages until there was no real visible design at all resulting in a coin error often termed as “struck though a capped die”. With each strike this 5c piece grew wider and fatter and edged its way around and up the sides of the hammer die creating the enormous capped or bottle top shape. It was likely jammed in position until it was removed by a Mint technician. It struck so many subsequent brockage coins that the obverse design has completely gone. The reverse design inside the cap is very strongly struck after being hammered many times. Looking at this coin for the first time it could easily be suggested that there’s more metal in the error than in a normal 2.83g 5c planchet and something fishy is going on here. However, when checked it does in fact weigh the correct amount. 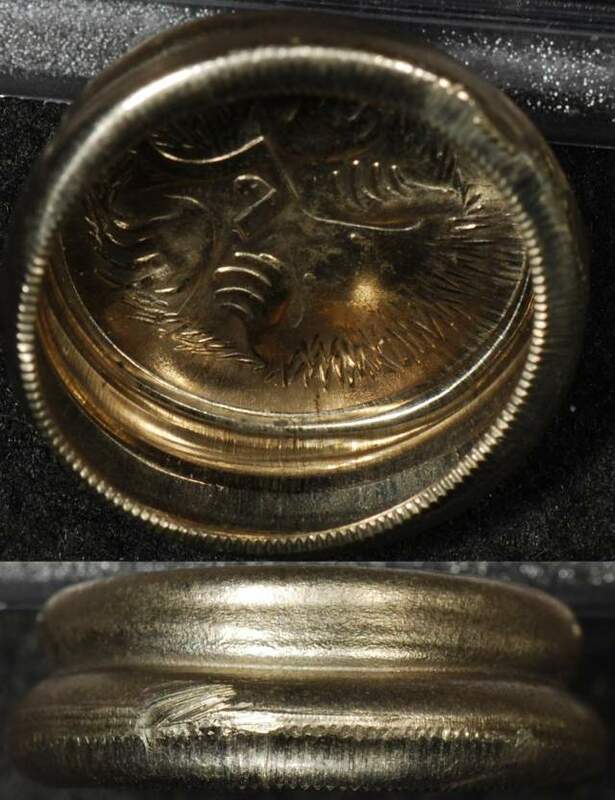 As the die cap struck more and more coins the metal flowed up and round the reverse die forming the characteristic bottle cap shape. The metal has extruded so much that the wall thickness of the cap is very thin indeed. Whilst it’s not possible to determine the date of manufacture as the obverse has been obliterated after striking those multiple numbers of brockage coins we have determined from the provenance of the coin that it is likely to originate from the late 1960’s.